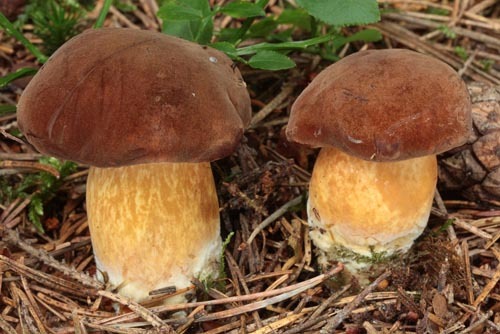 Cap up to 15 cm, at first hemispherical, later convex to flattened, dark reddish brown, chestnut brown to dark brick coloured, smooth when dry, but distinctly viscid in wet weather. 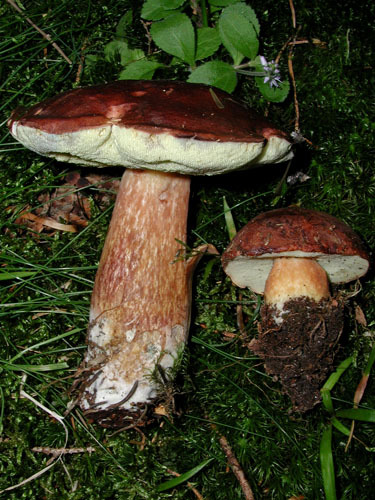 Stipe cylindrical, spindle-shaped or almost club-shaped, often tapered towards the base, concolorous with the cap or slightly paler. Tubes cream to pale yellow, blueing or not blueing when injured. 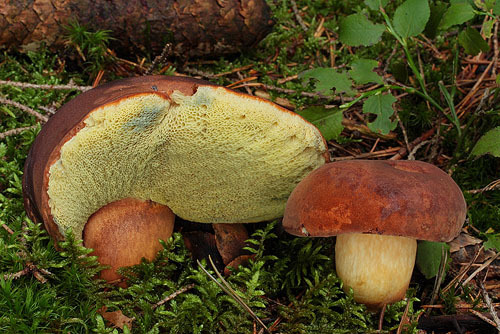 Pores concolorous with the tubes, blueing when bruised. 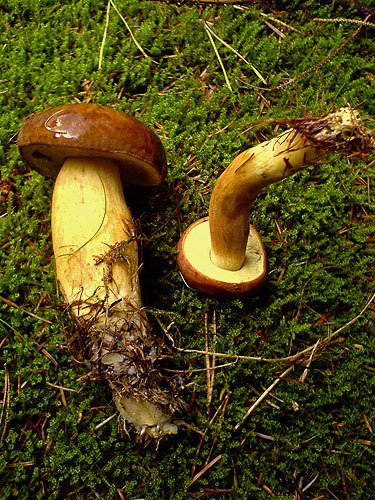 Flesh whitish or yellowish, blueing in the cap when exposed to air. Smell not distinctive. Taste not distinctive. Spores 11–15 × 4–6 μm, smooth. Pileipellis trichoderm of septate hyphae of cylindrical, smooth or incrusted cells. Habitat. 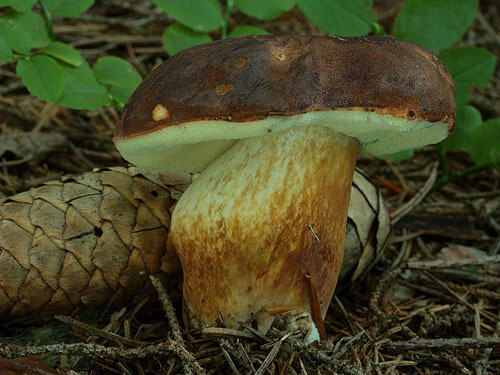 Mainly in coniferous or mixed forests, mycorrhizal mostly with spruce (Picea) or pines (Pinus), but also rarely with beech (Fagus) or oaks (Quercus). Distribution. 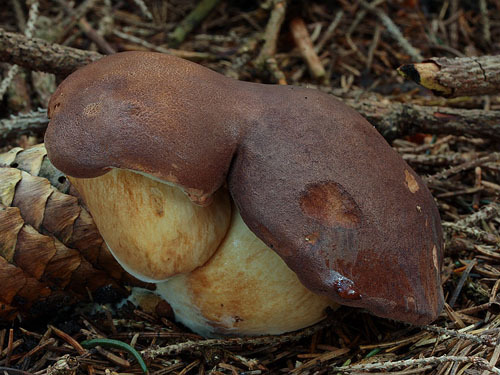 In Europe widespread and common. Similarity. 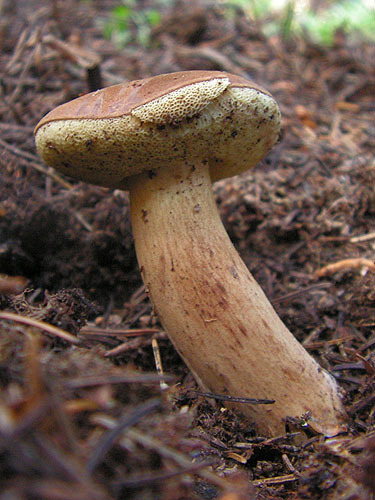 Usually easily distinguished, Xerocomus badius may sometimes slightly resemble Xerocomus moravicus, but the later has white flesh that is not blueing, unchanging yellow pores and grows in different habitat.